Note: Sir Muhammad Iqbal, Speeches, Writings and Statements of Iqbal, comp. by Latif Ahmad Sherwani (Lahore: Iqbal Academy Pakistan, 1995), p. 342. Bibliography: Iqbal, Sir Muhammad. 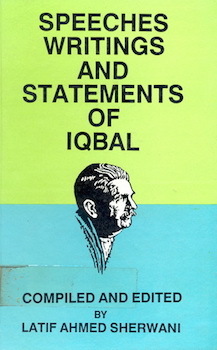 Speeches, Writings and Statements of Iqbal. Complied by Sherwani, Latif Ahmad. Lahore: Iqbal Academy Pakistan, 1995.